Scientists can now manufacture lithium ion microbatteries the size of a grain of sand through 3D printing, Forbes reported. The new development could enable a variety of robotics, medical and communications devices that were not previously possible. Engineers have created many tiny devices, such as medical implants and miniscule cameras and microphones. However, there was not a power source small enough to support these devices. Batteries were as large or larger than the devices, which would inhibit further developments, according to the source. Microbatteries were enabled by 3D printing because scientists were able to layer tightly interlocked, thin electrodes. Small batteries were traditionally made from thin strips of solid material, and they were not able to hold enough energy to power high-tech, miniscule devices, Voice of America stated. With 3D printing, layers of materials enabled the batteries to hold more power. 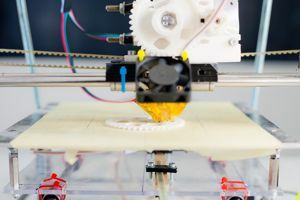 The process required the development of specialized 3D printing ink. Researchers worked to create ink with the right chemical and electrical properties. For the batteries to conduct electricity, the ink needed to immediately harden upon application. The capability to develop increasingly smaller power sources could revolutionize how things are made and what is possible for manufacturing.